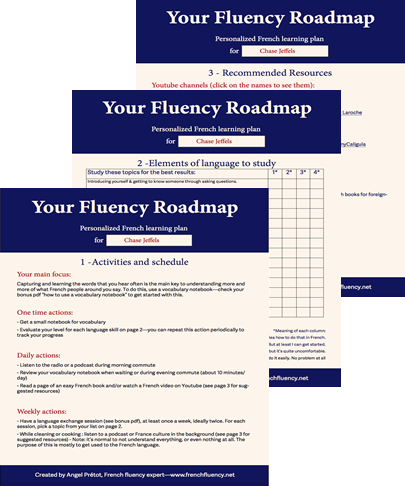 Your Roadmap to Fluency is a personal French learning plan, custom-made by me, for you. Some students have learned French within six months with just their Roadmap to Fluency, and no additional help from me. Your Roadmap to Fluency is all you need to learn French! However, it’s also a great way to kick off a more closely guided study, one-on-one with me. In fact, it’s the only way to start studying with me, because it’s the absolute best French learning process - and I want the best for you! Enrolment opens only a few times a year. Once you own your Roadmap, you will always have priority access to me over potential new students. This is the reason why new spots are only available when my current students have all the guidance that they want and need, plus there is enough free space in my calendar for new students. The next enrolment period will be in November 2018 - don’t miss it! In the meantime, make sure to sign up for my Free live class: Learn French Fast with a Foolproof Formula. Live class attendees will receive an exclusive one-on-one session worth $100 as a bonus!